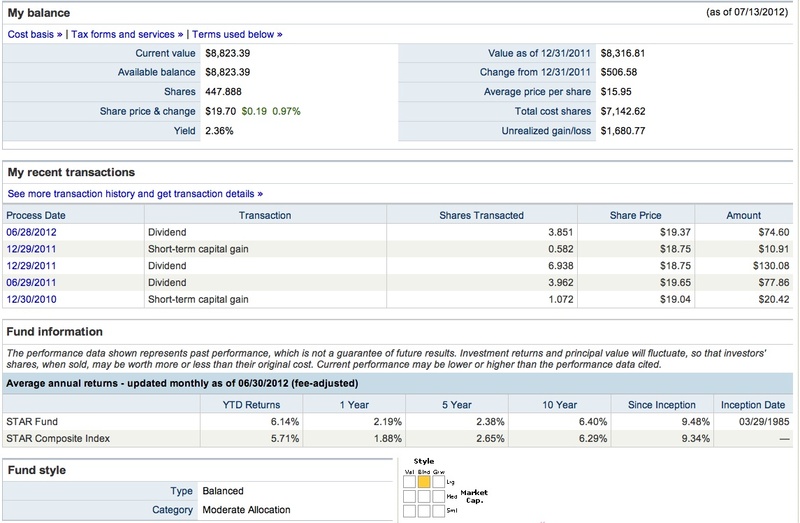 I will look at the dividend declaration page at the WSJ every night. This page will tell me about the dividend declarations made that day (Monday, 7/16), and the securities going ex dividend in two days (Wednesday, 7/18). That data will be replaced later today with the current data. In today's version, I noticed that Goldman Sachs declared its quarterly dividends for its three equity preferred floaters, with 7/24 being the ex dividend date for GSPRA (own), GSPRC and GSPRD (own). MFS Multimarket Income Trust (MMT) is ex dividend today for its 4 cent per share monthly distribution. I own 300 shares in the ROTH IRA. Bridge Bancorp (own) is ex dividend today for its quarterly dividend. This bank offers a 5% discount for investors enrolled in its DRIP. An article in the NYT highlights that certain hedge funds receive non-public information from analysts about companies. Morningstar published a useful article yesterday about the New Medicare Surtax that goes into effect next year. It is important to figure out whether you are likely to be hit with that new tax, which is part of Obamacare, and what can be done to minimize its impact. I prefer to own this kind of security in the ROTH IRA, since its income generation is tax free when paid and also when withdrawn. Needless to say, this steady stream of bond redemptions, made possible by the extended Jihad Against the Saving Class, requires an investor to take on more risk to generate income. I would much prefer to avoid junk bonds altogether. GFW was an investment grade bond. In the regular IRA, the distribution would be tax deferred, meaning that I do not pay a tax on it when paid, but I have to include withdrawals form a Regular IRA in my taxable income. While I have made some profitable trades, my remaining 200 shares generated a profit of slightly over $100. I had bought those shares, not for possible appreciation potential, but for the income generation paid into my IRAs. 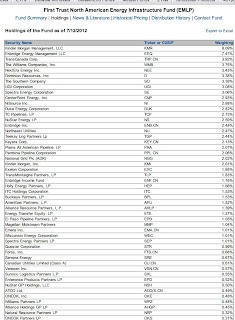 The only shares that generated a profit was a fifty share lot bought in the ROTH IRA $22.63 (February 2010). In that account, receiving 2 1/2 year of bond interest, without losing money on the bond, is viewed as a victory. 2. Bought 50 of the ETF EMLP at $20.87 Last Friday (see Disclaimer): This is another new ETF that I came across while researching MLP funds. I decided to buy some shares based on a few usual features provided by this security compared to AMLP and MLPA which were bought last week. The expense ratio is high at .95%. The sponsor claims that it will be actively managed which may not turn out to be good. In addition to owning MLPs that own pipelines and other energy infrastructure assets, this fund will own other companies that derive "at least 50% of their revenue from operating or providing services in support of infrastructure assets such as pipelines, power transmission and petroleum and natural gas storage". As a result of this broader mandate, the fund could own utilities, Canadian income trusts and their successor companies and other non-MLPs. This transaction was executed in a satellite taxable account. 3. 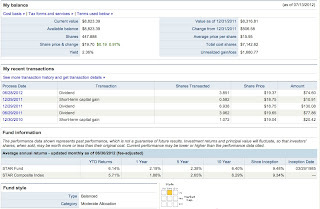 Vanguard Star Fund and Vanguard Life Strategy Growth Fund(own): I own a few funds that invest in other funds. I generally shy away from that approach since there are frequently two management fees. I would not have a problem with that approach where both the management fee and the acquired fund fees are equal to or less than .5%. That would be the case with the iShares S&P Moderate Allocation Fund (AOM): Overview, which has a .45% expense ratio which has temporarily been lowered to .31% due to a few waiver. AOM rose 1 cents yesterday to close at $30.75. 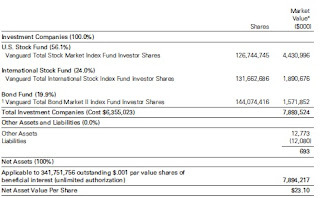 I recently bought only 50 shares of the iShares Morningstar Multi-Asset Income Index Fund (IYLD), and may buy another 50, even though that fund has a total expense ratio of .6% after a .06% expense waiver. The acquired fund fees totaled .41% plus a .25% management fee. Hopefully, IShares will reduce the acquired fund expenses over time as ETF competition heats up. (e.g. the two largest component are EMB, which currently has a .6% expense ratio, iShares J.P. Morgan USD Emerging Markets Bond Fund (EMB), and iShares iBoxx $ High Yield Corporate Bond Fund (HYG) with a .5% expense ratio. IYLD rose two cents in yesterday's trading. I made an initial investment of $3,500 in June 2009; added another $1,000 during 2009; and another $1,000 in 2010. That is it other than reinvesting dividends. I will leave this kind of investment alone for a long time. 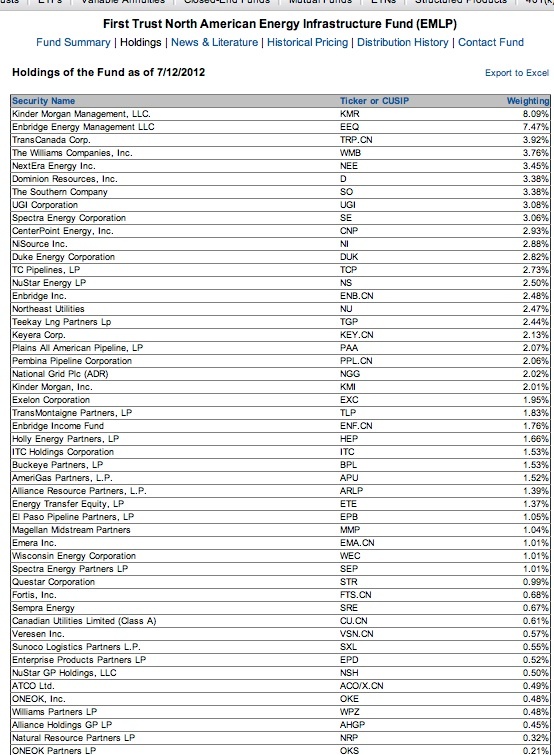 I would add that the spirit is not moving me to do much of anything at the moment, including adding to this type of mutual fund holding, though I did manage to buy yesterday 100 shares of a low cost low volatility stock fund sponsored by IShares. Maybe I will be able to discuss it by Friday: iShares MSCI USA Minimum Volatility Index Fund (USMV) which has a .15% expense ratio. As noted in the foregoing snapshot, the Vanguard Star fund started on 3/29/1985 and has returned an annualized 9.48% since that time through 6/30/12. The five year return, for obvious reasons, is anemic at an annualized 2.38%. The holdings can be found at MSN Money. The Vanguard Star Fund was unchanged at yesterday's closing net asset value. 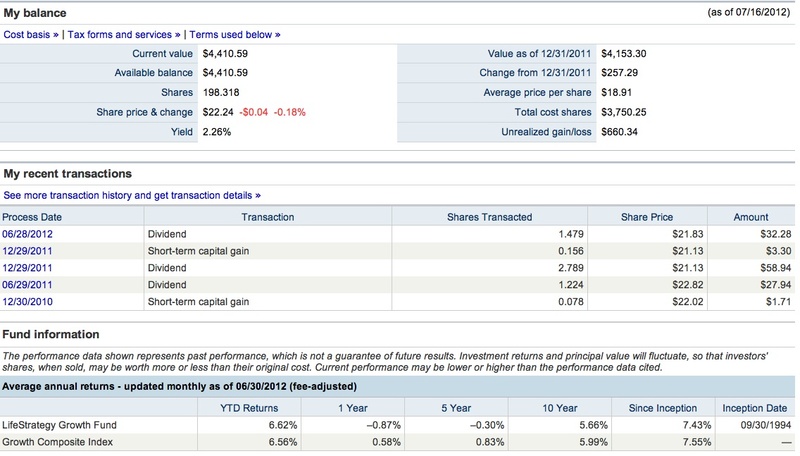 As of that date, VASGX owned three low cost Vanguard Index funds. VASGX has a three star rating from Morningstar and has underperformed Vanguard Star over the past five years. That is not surprising given what happened to stocks since 2007 and the Vanguard Star fund has more of a bond cushion. There are also Vanguard Life Strategy funds for Moderate Growth, Conservative Growth and Income: Vanguard - LifeStrategy Moderate Growth Fund (60 stocks/40% bonds); LifeStrategy Conservative Growth Fund (60% Bonds/40% stocks); Vanguard - LifeStrategy Income Fund (80% bonds/20% stocks). As you would expect, the last fund has had the best five year record. When I set this up, I decided to tilt the allocation scheme of the Vanguard Star fund slightly toward more stocks by adding the Vanguard Life Strategy Growth Fund in a smaller amount than my Star contributions. 4. Bought 1 Quicksilver Resources 8.25% Senior Bond Maturing 8/1/2015 at 94.25 Last Friday (Junk Bond Ladder Strategy)(see Disclaimer): I now own 3 KWK senior unsecured bonds and that is my limit considering the risk. This debt is rated B2 by Moody's and CCC+ by S & P.
The S & P rating is a result of a recent downgrade: TEXT-S&P In that report, S & P stated the company was "highly leveraged" and "vulnerable". I would not disagree with those descriptions. The 2015 note is referenced at page 87 of the 2011 Form 10-K. Without going into detail again, I would just note that the major problems faced by this company are its high leverage in the context of low natural gas prices. One potential upside is KWK's emerging oil plays. I also own the common as a Lottery Ticket: Item # 1 Bought 50 KWK at $5.3-LT Category That post contains one of the more detailed discussions of the problems. I noted in a post from earlier this month that Barclays cut its rating to underweight and lowered its price target to $3. Stocks, Bonds & Politics A discussion of a recent earnings report can be found at Item # 1 KWK. The company is controlled by the Darden family. I would hope that this family would sell KWK to a larger and more financially stable energy company, preferably before KWK runs into debt refinancing or unresolvable debt covenant problems. I have an unrealized loss in two 2019 KWK bonds. The price has fallen to below 90 after natural gas prices continued to slide. 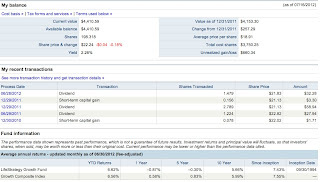 Bought 1 Quicksilver Resources 9.125% Senior Bond Maturing 8/15/2019 at 99 (February 2012); Bought 1 Quicksilver Resources 9.125% Senior Bond Maturing 2019 at 97-ROTH IRA (May 2012). One benefit of buying bonds in small lots is that I can average down without exceeding my limit for that issuer. I am now at my limit with 3 KWK bonds. The common stock, KWK, had a bad day yesterday, falling 7.52% to close at $4.67.